This Guacamole Recipe is easy to make with only 5 ingredients! The simplest Guacamole Recipe, with 5 ingredients it doesn’t get any easier! 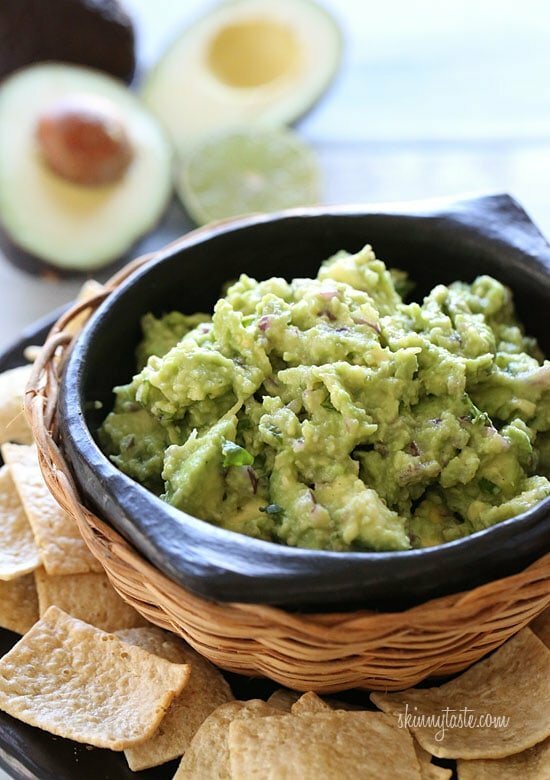 Guacamole is a healthy dip – a staple at every gathering and a must when we have taco nights! 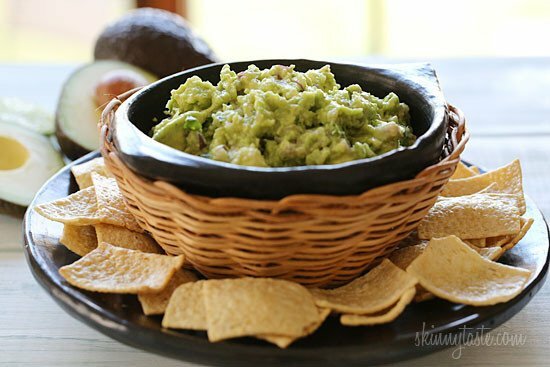 Tommy is always in charge of making the guac, and he has converted many non-avocado lovers with this recipe. Guacamole really is best when made fresh. 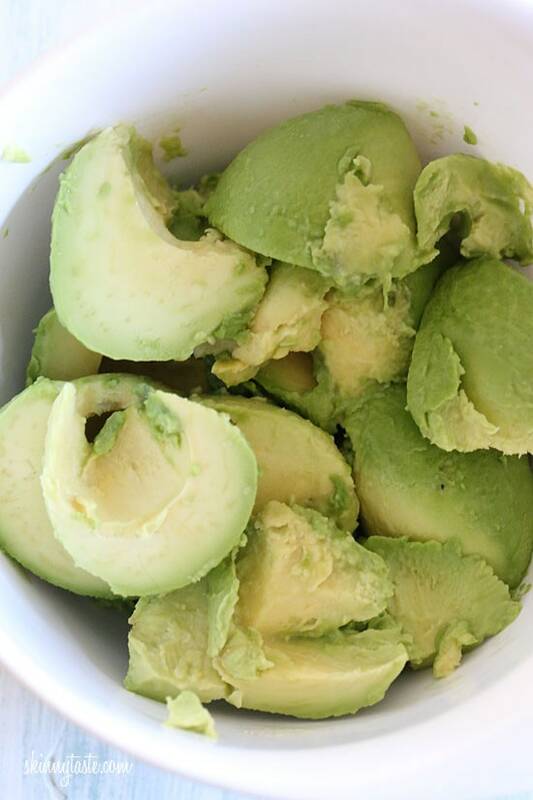 But, if need to make it a little ahead of time, put the pits in the bowl with it, along with some cut up lime wedges and cover it tightly with plastic wrap on the surface of the guacamole. Adding extra lime juice help prevent browning. I recommend making it the same day, but if you must this should keep 1 or two days. If the top browns, scrape the top and the rest should be green. Avocados may be high in fat, but they have the good essential healthy fats which we should consume every day. They are also high in fiber, rich in vitamin B, E and K and have 60 percent more potassium than bananas. I love avocado so much I created an entire Avocado Obsessed Pinterest board in their honor. Guacamole is great with baked tortilla chips, lentil chips, baked plantain chips, chicken fajitas, or even on a wrap in place of mayonnaise. Sometimes we even make guacamole turkey burgers. Super easy, only 5 ingredients. I love this recipe. It’s not that blend as other says. I’m one of those people who can’t eat too much heavy tasting rich food. Too much roasting and frying is bad for the liver you know. I heard a slice of onion on top of the guacamole before wrapping keeps it fresh longer….anyone else know about that?? This is fabulous guacamole! I live in Tucson, where the restaurants make a show out of assembling guac at your table side, and this is so much better!! I would leave guacamole without garlic. The name of this recipe is spot on because it’s just as good as any guac that I’ve eaten in Mexico. I made the recipe exactly as written and it’s just so delicious! After reading the previous replies, I put one of the seeds in my guac and it totally worked! My hubby was eating it all night and didn’t cover it back up properly but it didn’t turn brown. This is now my go to guac recipe! Thank you!! Not sure if anyone has already posted this, but the surefire way to To avoid guac going brown, is leave the pit in the bowl with it and cover with plastic wrap until you serve. The lime juice will prevent it from turning brown. Gina, what should I do if my stomach can’t handle the red onion? 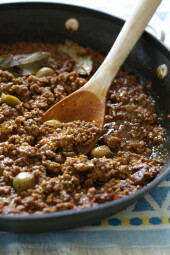 Should I try minced onion or onion powder? Curious as to what you would suggest as I love guac! Leaving out the onion definitely affects the flavor. Try something else per your taste. Very good recipe. I add a little more garlic since I love the taste. I love Avacadoes so much, I just remove the meat from the shell and pour French dressing over it and eat with a fork. I add some jalapeño to mine for a little kick, and a table spoon of sour cream for extra creamyness. Yummy! 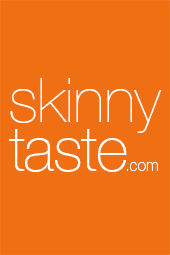 Gina, Try it with some julienned kale added – Great!! I made it!!! It is the most awesome guacamole I ever tried. My older daughter doesn't like avocado, but this thing she ate so fast! I didn't change anything in this recipe, and it is perfect that way for my family. Thank You! I make mine nearly the same. I leave out the cilantro and add dried cumin. But otherwise the same. I love it! Very simple, very good. I had everything already on hand which was great! I'm still learning what flavors mix well so this really helped. Thanks! Ok, silly question but I'm new to calorie counting….Are those calories for the whole amount or just one serving? I just made this, having never made or even ordered guac before. It is delicious – followed the recipe exactly. I just made this. It was ABSOLUTELY delicious!! I just added some tomatoes. So, so, so good. Love your site, Gina! Oh Gina! You got it right here lady. I'm from Colorado and from that state South, guacamole is serious business. There are rules to making perfect guacamole and you nailed em. Fresh, natural ingredients only. Mashed by hand, never EVER with a food processor, blender or other machine. Finished product must be chunky. And a tip: as soon as you cut avocados, dunk them in ice water for 20 seconds. This keeps them from browning as well. Guacamole is my FAV snack. I love it so, so very much. I've made it a ton of different ways and love it every time. We usually include tomatoes and sometimes jalapenos. It isn't the same without lime juice too! My thirteen year old son made guacamole tonight and did a good job. Thanks for sharing! I love the lime flavor in guac and find that adding the zest from the lime bumps it up a notch – Delicious! Thanks for the recipe. One way to keep the guac from turning brown is layer thin slices of lime all over the top. Looks nice for presentation too! I love guacamole and usually get it from whole foods…well recently they started making "kalemole", guacamole with kale…its AMAZING! Can you make a version with Kale in it?? Found those chips on sale in Whole Foods. Stop and Shop carries a few flavors. whole Foods had 5 varieties!!! I follow your avocado board on Pinterest and didn't even know it was you! I love it! Just had half an avocado, mashed, on a sprouted wheat English muffin with salt, pepper and lemon juice! My fav breakfast! Your guac looks yummy. Maybe the other half for dinner! I love it, it's so simple and delish!! 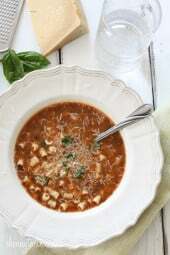 Gina, I add tomatoes to my recipe which is very similar to this one. I've always used the regular sized avocados and I add one tomatoe per avocado. Cut tomatoe in small chunks and drain the natural juices before adding to guacamole, might have to increase the salt just a little to compensate for the tomatoe added. Reduces amount eaten,therefore less calories per serving. First, I love your site and I recommend it to anyone who will listen to me! Thanks for your wonderful blog! I bet that's really pretty! They were Baked Lentil Chips with sea salt. Gluten free, the brand is Mediterranean Snacks. I found them in the gluten free section of my supermarket. I could eat guacamole at every meal. Loooove it! 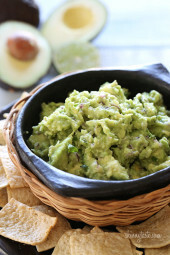 Gina – have you actually tested the "pit" trick to keep the guac from turning brown? I have, several times, and it absolutely has no effect. The only way to keep guacamole green is to put plastic wrap directly on the surface of the guacamole to keep it from being exposed to the air, which is what causes the browning. I also wrap it in plastic, so perhaps that is what keeps it from turning brown, I do both. Lee Ann, a secret of the Southwest, immediately after cutting your avocados, dunk them in ice water for 20 seconds. This prevents them from turning brown. Not sure why, but it works. I always add a little cumin to my guacamole and I skip the onions. Do you know how much this makes? I'm thinking of making it so that a pumpkin is barfing guacamole, but I don't know if I should double the recipe. I’m thinking it wouldmake about a cup…so ?depending on how big a pumpkin you’re wanting to barf – ha ha ha ?you might want to more than double it. Cool idea by the way! Hey 3 pumpkins….1 barfing guacamole 1 barfing salsa and 1 barfing kickass hamburger-cheese dip! oh! and maybe a cool looking cauldron of tortilla chips!!! THANKS FOR A GREAT IDEA!! There is also another way to keep your Guac from going brown. Leave the seed in your mixture and cover with syran wrap. Thank you so much for posting this recipe! I just made this and my husband who claims to hate guacamole can't keep his hands off it. Thank you! Another great way to keep from turning brown- place a piece of plastic wrap or even a baggie on top of the guacamole,sealing the edges. It will keep for almost a week or more this way. Thanks for the recipe! That's how I make mine too. Sometimes I add some salsa if in a hurry. I put the avocado pitt in my bowl with the guac it keeps it from turning brown. That’s what I do to, it certainly helps, but I am gonna try the saran wrap and see if I can get it to keep a little longer. I am a freak when it comes to eating Avocados, I absolutely love them. So I know I would love this. Thanks Gina. I’m such a guac fan – this is terrific! I wonder how it would affect the points to add roasted red pepper and corn to this?